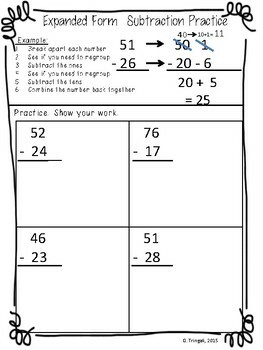 Students are expected to use many different strategies to solve addition problems. 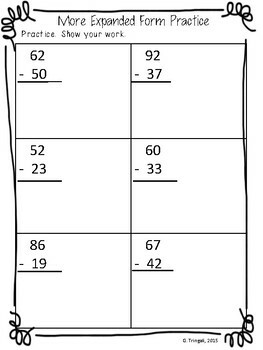 This worksheet is designed for the Expanded Form (Break Apart/Decomposing) Strategy. It has an example at the top of the page which reviews or teaches the strategy. Then there are 4 problems students can practice. They include no regouping and regrouping problems. This can be used for homework because parents can see the example at the top, or classwork. It's great for a substitute since there is an example as well. 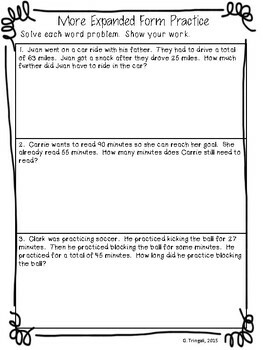 Also included are extra practice pages, word problems, and answer keys.